enable Tuner 4.0 free download. Use it to tune your instruments quickly, easily and more precisely than ever before. The tuner provides real-time tuning for a range of instruments, including presets tunings for a number of string and wind instruments. Preset tunings include a range of styles and tranpositions, and even orchestra and jazz references for wind instruments. The tuner will determine your instrument�s current frequency to high accuracy, and tell you the corresponding musical note. Use the preset tunings, or experiment with your own custom frequencies. You can also use the octave offset and transposition facilities to aid you in writing music or transcribing pieces you don�t have sheet music for, and learn to tune by ear using the Play Tone feature, which generates the note you are trying to play while you tune to it. Tuner comes complete with an integrated metronome providing a range of preset speed styles and facilities for custom speed intervals. 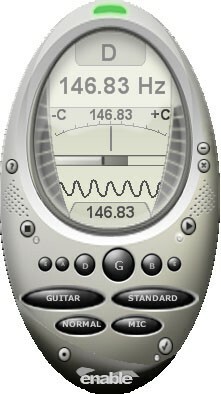 Use enable Metronome to practive, with output available through both visual indicators (flashing LED) and auditory means (drum samples or the tune frequency used in the tuner). Easy, fast and high-precision tuning with enable Tuner ensures that your instruments will sound better than ever before. It�s the tuner you�ve been waiting for.